Headlies: It's The Great Pumpkin, Dixie Carter! - WrestleCrap - The Very Worst of Pro Wrestling! 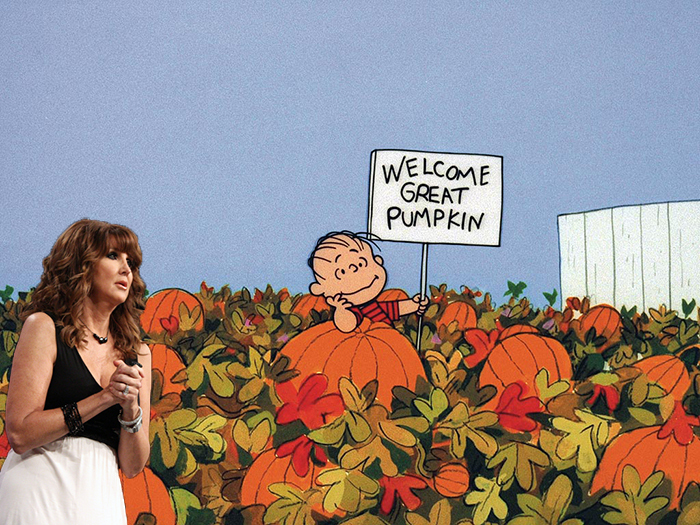 Headlies: It’s The Great Pumpkin, Dixie Carter! Bethlehem, PA – A cool autumn breeze whipped through TNA president Dixie Carter’s hair as she made her way through the Bethlehem Pumpkin Patch. Carter was planning to spend her entire Halloween evening in the pumpkin patch to meet The Great Pumpkin. TNA had recently wrapped up a long string of television tapings in the area, but Carter stayed in town in order to meet The Great Pumpkin, a mythical creature that grants wishes to good girls and boys on Halloween night. Before hanging up, Gaborik gave Carter words of encouragement while he updated his resume. As the night wore on, Carter’s anticipation for the Great Pumpkin grew. She was teased by several trick-or-treaters who were all dressed as ghosts. “Or Ted Turner!” exclaimed “Easy E” Eric Bischoff. “I’ve got The Rock,” said Vinny McMahon flatly. After the group left, a shadowy figure arose in the pumpkin patch. “It’s him! It’s the Great Pumpkin!” shouted Carter with glee. Carter’s excitement turned to disappointment as the figure turned out to be TNA wrestler Jeff Hardy. “I am a creature of the night!” shrieked Hardy. “Yeah. Great. Whatever, Jeff. Can you just give me a ride home?” asked an indignant Carter. “I flew here on a magic carpet made of rainbows and empty White Out bottles! Happy Halloween! OOOOoooooOOOOooo!” screamed Hardy. “Good enough. Let’s go,” said a tired and cold Carter. 4 Responses to "Headlies: It’s The Great Pumpkin, Dixie Carter!" Then just as Dixie was leaving out came Lucy holding up a new tv contract from Spike. Tears in her eyes Dixie ran over to grab it when Lucy cruelly pulled it away, “What a blockhead.”, was all Dixie heard as Lucy walked away. This Headlie is great, and makes me want to break out my Vince Guaraldi Peanuts soundtrack CDs. I’m going to miss Dixie if TNA goes away. When Vince screws up, like he has been recently, it’s just boring and depressing and I find other things to do.